The monarchs may have moved on for the most part but the garden is still active with other critters. About a week and a half ago, before the cold front, I was out in the edible garden during lunch. Some days I move with purpose out there and other days I mostly tinker with plants and check different things. This day I was in the latter mood, moseying around to look at what had germinated over the last few days, when I looked up and noticed something amiss with the tomatoes. It looked like something had chowed down a couple of the top branches of one of the vines and my first instinct was to curse the deer. Then I remembered I was inside the 7′ tall fence and it was highly unlikely it had been the deer. I moved on to birds and squirrels but wasn’t quite satisfied with that answer but figured I would never know. 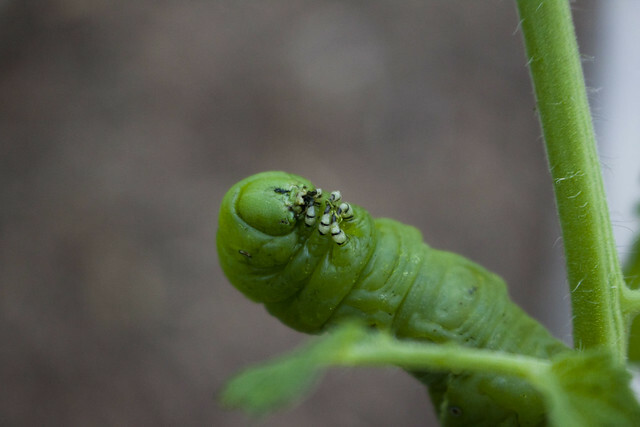 I wound around to the other side of the bed and was greeted with the culprit, a really cute and very hungry tobacco hornworm! Now, it has been a very, very long time since I have seen one in the garden and quite honestly I don’t even know if we have seen one here at this house. I remember seeing them in Florida from time to time but we’ve never had an overabundance of them anywhere we’ve gardened. I glanced around to see if my friend had any siblings but I didn’t see any and left it to continue munching while I went back to work. I later moved it to the brugmansias so it could eat that instead! 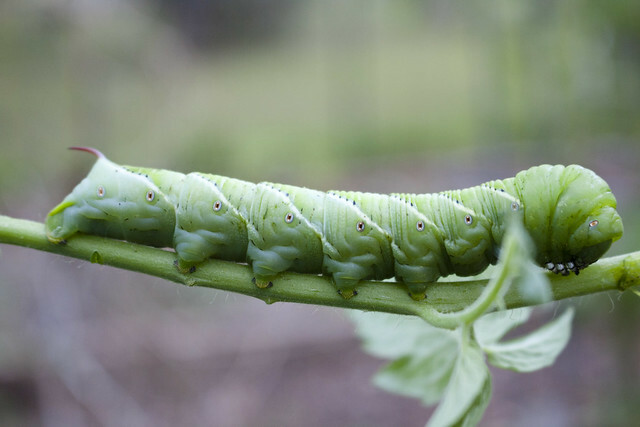 One thing I’ve noticed regarding caterpillars such as hornworms is the language used around them. 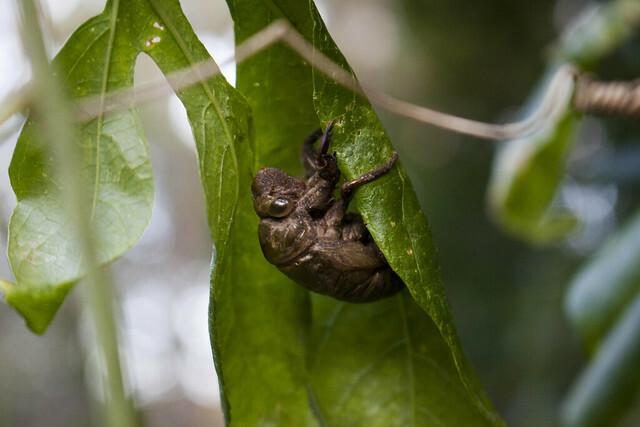 They are ‘voracious’ and will ‘strip your plants’ and other words like ‘bad’ and ‘gross’ are used. While their appetite might be a little stronger due to their size, I don’t see why the negative language needs to be used. Monarchs do the same thing. 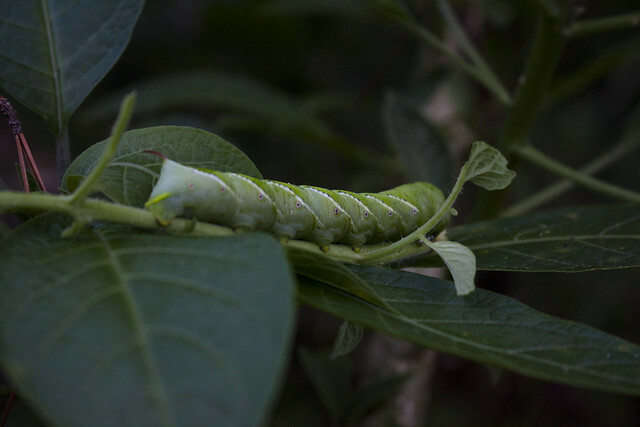 They have voracious appetites and will most definitely strip your milkweed plants of their leaves! That’s what baby larvae do. 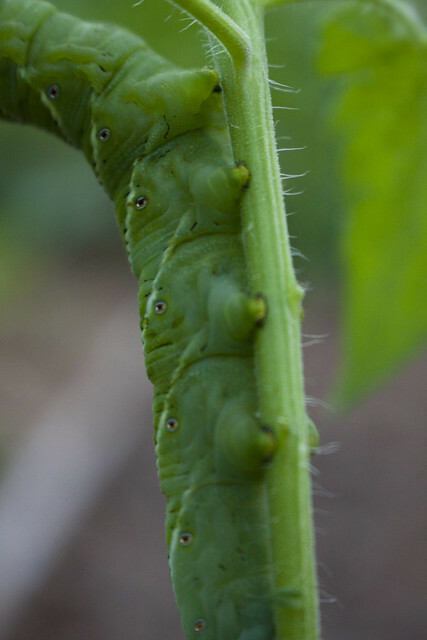 It’s just that, of course, some butterflies look more intimidating and enjoy your heirloom tomatoes while the others are the golden child of the pollinator world. Don’t get me wrong, I love monarchs, I just wish the language used around caterpillars and insects was less evil sounding and more pragmatic. 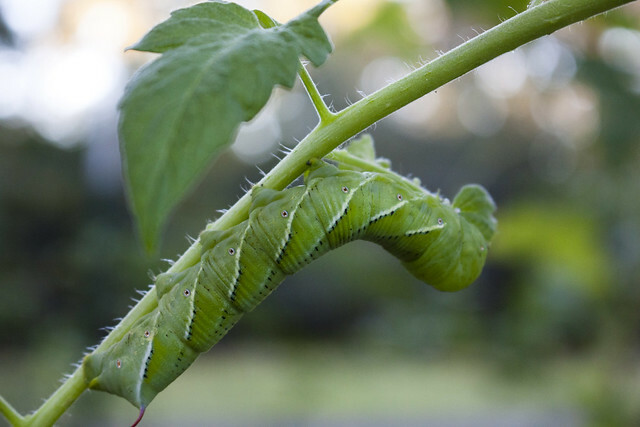 They are caterpillars going through the stages of metamorphosis—eating their host plants is what they do. Along with the tobacco hornworm, I have been slowly finding gulf fritillary chrysalides. 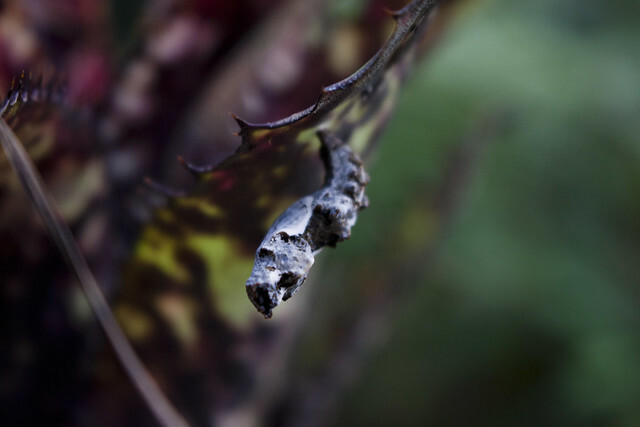 I found the first one attached to the underside of a bromeliad leaf the day before the cold front blew in and of course I found two more attached to a trellis in the garden. They appeared to not be as easy to move as the monarch chryalides so I ended up leaving them and just put a sheet over the trellis as a buffer against the cold wind during that weekend. Hopefully they pull through but I’m just waiting to see. The one on the bromeliad was brought inside with some monarchs I still had in chrysalides and it is now in the cage on the patio as I wait for it to emerge. And just this evening I found another one attached to a post on our porch, about 4.5 feet up! It looks new because I did not see it this weekend and it would be hard to miss! 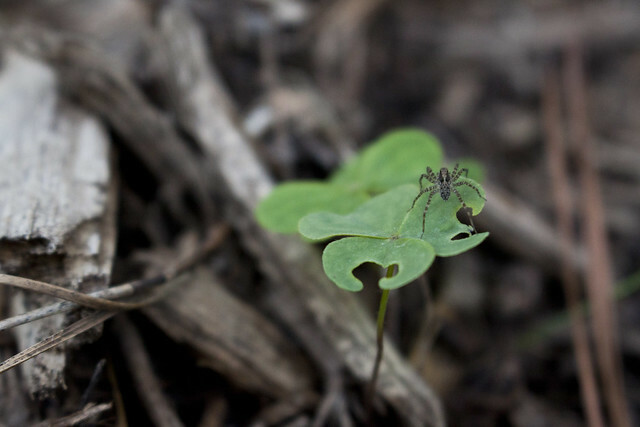 My last two friends include a cicada exoskeleton I found while crawling around in one of the flower beds and a sweet little spider sitting on an oxalis leaf. 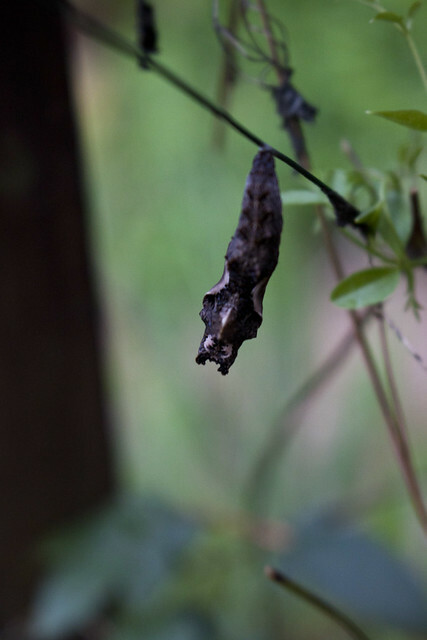 Oh, I did find what I think was a cloudless sulphur chrysalis underneath the Argentine senna but it was covered in mold. 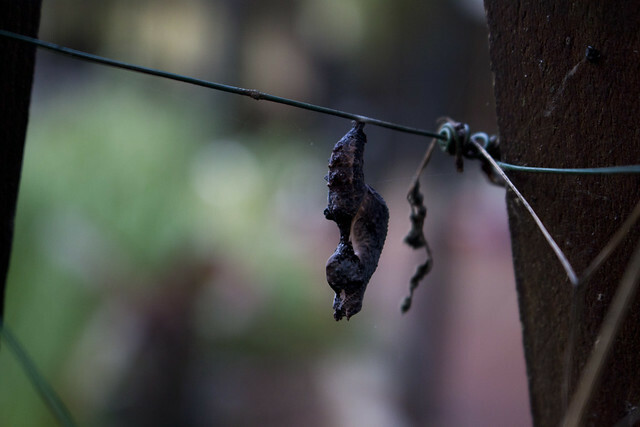 That was something I hadn’t seen before so I suppose it had been dead for awhile or was on its way to being dead. 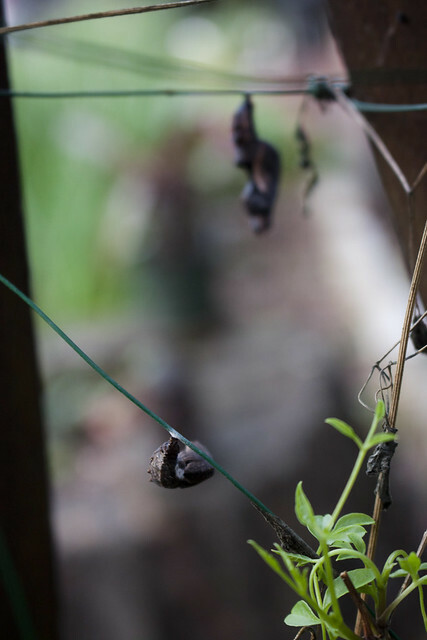 I’ve been actively searching for their pupa but have not see any yet. And I’m still keeping an eye out for my gulf frits on the passiflora but haven’t come across any more. Your garden is truly a habitat for all walks of life! I love that you know what everything is. At the moment, I have a spider in my backyard, but I don’t know what kind she is. She weaves a huge web that freaks out my pit bull though. 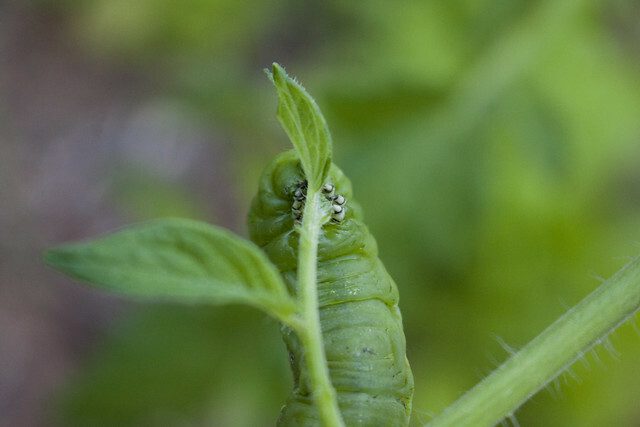 I completely agree with you about the language we use around caterpillars… The value judgments people tend to make, especially in most of our small-scale backyard gardens, hardly ever take into account the full scope of the ecosystems we claim to want. Do you like birds? You need caterpillars. Do you like native plants and robust ecosystems? We need the full complement of wildlife, including the boom/bust devourers that drive us up a wall when they defoliate our favorite plants. Also, the natural history of just about every lep species is SOOOO fascinating, *especially* in the larval phase. 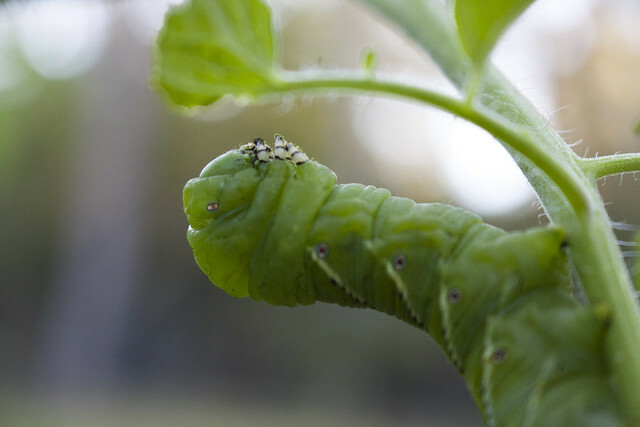 I think a lot of the general low opinion folks have about caterpillars is rooted in unfamiliarity. We focus on a handful of species, so everything else is an “ick”. Good for you for showing the closer perspective on species that get so much less love!